Getting into the biggest and best high school only invitational in the country is a feat upon itself. These are facts, not hyperbole. Performing at a premium level once you are there is another item once you in is strictly on you. Day two is the big day and it is LONG! Those who didn't prepare mentally and physically would be in for a rude awakening. Madison Myrick (Sr., Homewood-Flossmoor) has been more consistent in the high jump this season. One of the reasons is her strong approach and she executed it to a personal best performance. Myrick placed third in 5-5. This performance would ultimately become a consolation prize for the 14th place finish in the invite long jump. Olivia Schmitt (Jr., Lakes) made a big statement toward improving on her status as a runner since she was a freshman. Schmitt used a tremendous kick in the penultimate section of the 800m to produce a new school and personal record IL#1 2:13.83. Marianne Mihas (So., Latin) was in the next section and won in 2:13.91- rebounding from a tough race several weeks ago at the Florida State Relays. Ashanti Denton (Jr., Homewood-Flossmoor) dropped the kind of performance that many have been waiting for. The 55.76 third-place effort was a set up from the evening before in the 800 medley relay. Denton appears ready to be a team leader now. Amazingly though lost in the good efforts was the fact that Homewood-Flossmoor girls did not get an invite to compete in the 4x400 despite coming in with a sub 4:00 clocking indoors. The Lady Vikings actually ran 3:57 Friday night at the S. Pasadena Invitational. They won by nearly 10 seconds there and with stiffer competition, it is likely they could have challenged for the win in the open session. It was a tremendously long day for Riley Ammenhauser (So., Neuqua Valley). She has been a top-rated youngster in the triple jump. She had to compete first in the long jump where a 10th place performance a bit off. Ammenhauser could not use the benefit of a strong tailwind to reach the 19-foot mark. She could only muster 17-11.25... in her wheelhouse, Ammenhauser got out of the gate in the triple jump, she dropped a 39-7.25 foot effort. Her best jump was in the second round, it was a wind-legal 40-3.50 jump that positioned her well. All jumps were over 39-feet which showed consistency. The biggest test for the Lady Vikings was the 4x100 relay. Over the last several weeks, the chatter was about better handoffs and transitions. Friday's performance in the 4x200 was marred by a terrible transition at leg #3. So how would they respond in the spotlight against some of the elite teams in the country? Junior Kaylah McCall led off in a good position but a butchered exchange with her teammate was almost dropped. Fortunately, the quartet was able to recover and run 47.33- IL#1. But it's clear that more work must be put in to make a serious and safe run for the roses at the end of the season... McCall returned a short time later to run and place 7th in the 100H (14.25). "The girl next to me [Anna Hall] kept hooking me during the race," said McCall as an explanation of her performance. But hooking and "dirty play" did not stop Jasmine Jones of Atlanta, GA from dropping a US #1 time of 13.33. Five of the nine performers broke 14.00. 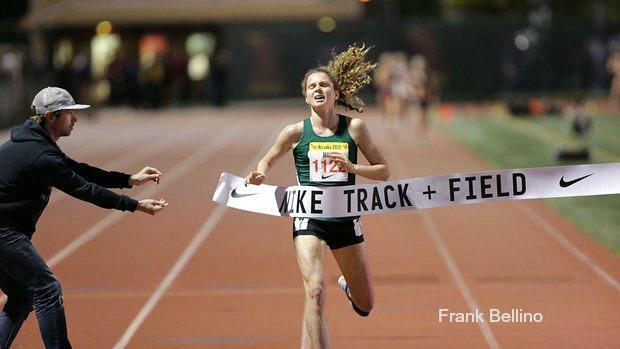 This is the invitational that's known for national records- 25 of them. Now make it 26 after Chloe Cunliffe cleared 14'8" in the pole vault. The West Seattle HS senior's clearance came on her first attempt after having the bar moved to that height, aware of the significance the bar was moved to 15-0. Cunliffe, the younger sister of superstar pro sister Hannah Cunliffe, had the crowd on the edge of her pole. She almost cleared it on the second attempt but the bar brushed her thigh. There is no doubt we will see the first 15-footer in the record books before the end of the season. The main event of the entire invite is the 3200m. A slew of our state's best came and sought to run some amazing times. Brett Gardner (Jr., Lincoln-Way East) did not waste too much time in the seeded race, leading through the first mile and turning up the volume with each step. He would eventually finish fourth in the seeded race running lights out in 9:07.76. Mathias Powell (Sr., Mahomet-Seymour) traveled with Garrett Dixon (Monticello), who ran a 9:15 on Friday night. Powell was inspired by his good friend's effort and ran 9:10.13. These times along with Tommy Brady (Sr., Maine South) and his 9:11.62 bodes well. Katelynne Hart (Jr., Glenbard West) was the star of the show of course. The cover girl came in as the favorite and did not disappoint. Right away she set the pace with a 68-second first lap that separated from the field. Only Sydney Thorvaldson (So., Rawlings WA) was able to give a competitive chase... for a little while. Hart hit the first 1600 in 4:54 and dropped Thorvaldson. Though the early pace was hectic, Hart was able to defend her title and break the watershed mark with a national leading 9:59.57. The time was also the fourth fastest effort in this prestigious meet.